I have several blood vessels that are clearly visible on my eyeball. They seemed to have appeared over the last 10 years.They do not bother me but look awful. Is there anything available to make them go away or to deminish the redness? And how did they get there? this is zari. i have problem that when i do work on computer, using projector, multimedia, microscope or long time studies, it causes terrible headache and pain in my eyes especially right eye. i dont have any specific problem of sight still i use specs. but what really i should do i dont know. kindly help me what is the bassic problem of my eyes and what should i do. The information on this website so helpful. Thankyou very much. I needed to do an assignemnt and this information helped alot. I had damage to my eye when i was 4. Now that im older I hate it! I have one brown eye one black, a white scan inside my eye, and i have a HUGE scar on my eye lid. I had surgery in my left eye, and they took out the lens and did not put in a new one, the doctor told me (after he took out my lens) that he didnt see a point to put it back it. ( no idea why they took it out in the first place) Is there any new developments out there that I can take advantage off? wel my mom also have an eye problem...she was visiting her doctor for her check_up..why dont you ask to a specialist?? I have been told that there is a blocked artery in the rear of the eye socket, wich has caused partial blindness in that eye. How can this problem be rectified? I have been having the aura of a migraine without the migraine for about thirty years. It started coming about once in ten years and now has been coming a few times a week. Afterwards my eyes feel blurry for a while. I also see double. A doctor told me six years ago that there was nothing wrong with my eyes other than needing glasses but he had a very nasty attitude. What might I be dealing with here. Also, haven't been to an eye doctor since Mr. Nasty. 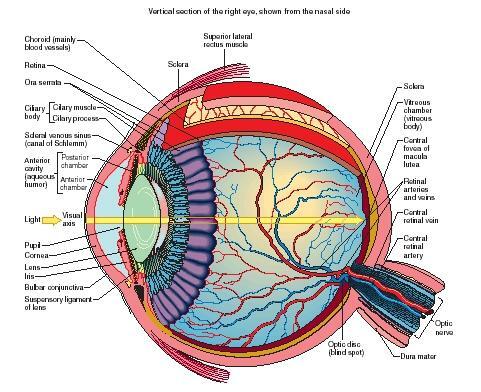 I'm a biolgy student An i'm doing the human eye this helped me alot.Thank you very much. Hi I am blind on my left eye and I wanted to know if there is any surgery that can help. When I cover my right eye I can see a little bit, but dark and blurry. when look at light and you put fingers in front off me I can see them a little. I had surgery when i was very young for a detached retina. I just wanted to know if there is anything that can be done for me? I can see my own eye fluid in certain light with my eye almost closed. There were lots of long strands floating around and after looking at images on beta amyloid plaques on the internet I decided to take turmeric as my mother recently died of alhziemer's disease. When I look at my eye fluid now the eyes are clear of the strands and other stuff floating. Is this just a fluke and can plaques be visible sometimes in the eye fluid? P.S I did not look in a mirror, just one eye looking through half closed lid at at its own surface. I sometimes see water waves in my eyes at random times like when I'm driving and doing other stuff and I don't know what to do about it because I'm only a teenager and very confused. My wife has just started seeing waves of what looks like water moving accross her right eye, sometimes! Is this serious or something simple? She says she can't see me when it happens, not blackness just very blurry! Thanks for the help! what is the convex membrane covering the eyeball called ? Huh?i wonder if supermans rods & cone receptors are able to generate x-ray vission & heat-ray vission?